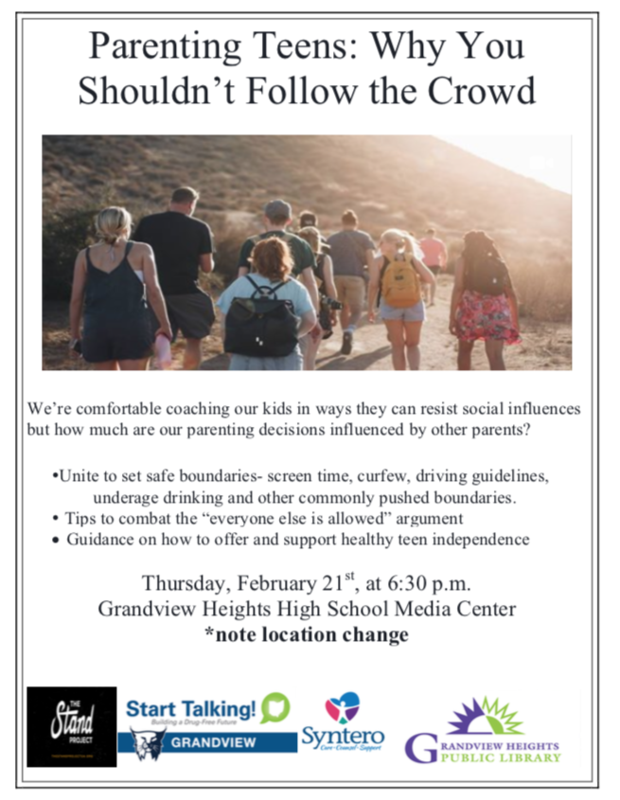 Join The Stand Project, Start Talking Grandview, Syntero, and the Grandview Heights Public Library for a special presentation: Parenting Teens: Why You Shouldn't Follow the Crowd on Thursday, February 21, 2019, at 6:30 p.m. at the Grandview Heights High School Brotherhood of Rooks Media Center located at 1587 West Third Avenue (second floor). Please note the new location change! The conversation will be led by Syntero Clinicians Tory Trimble and Debbie Culp for a community conversation about parenting, parental peer pressure, and strategies to unite around healthy behaviors.